This Easter visitors to Chedworth Roman Villa will be transported back in time thanks to the latest digital technology developed by our EngD student. A large inflatable dome will be installed on the lawns of Chedworth Roman Villa, allowing groups of visitors to experience a planetarium-style projection which brings to life the history of one of the country’s most important Roman sites. Stepping inside the ‘Discovery Dome’, visitors will be immersed in a presentation showing the creation, development, loss and discovery of Chedworth Roman Villa. Visitors can see the pre-Roman landscape, then experience the Roman Villa develop all around them, before seeing its loss and rediscovery in 1864. The projection concludes with a flight through a ‘data cloud’, the digital record of the Villa as captured by a laser scan of the entire site. Alex Auden, Operations Manager at Chedworth Roman Villa said: “This year, as we celebrate the 150th anniversary of the Villa’s discovery in 1864, our focus is on helping visitors to make their own discoveries about this extraordinary site. National Trust Curator Rupert Goulding describes the experience of being immersed in a digitally constructed landscape: “It can be hard to look at the ruins today and imagine what the Villa might have looked like in its heyday, or to understand how the Villa was lost and buried. But the Discovery Dome can show this by putting you in the middle of the site as the Villa is constructed and then degrades all around you, at what feels like life size. The Discovery Dome is the focus of a University of Bath EngD project co-funded by the National Trust into the application of technology in bringing the past alive at heritage sites. 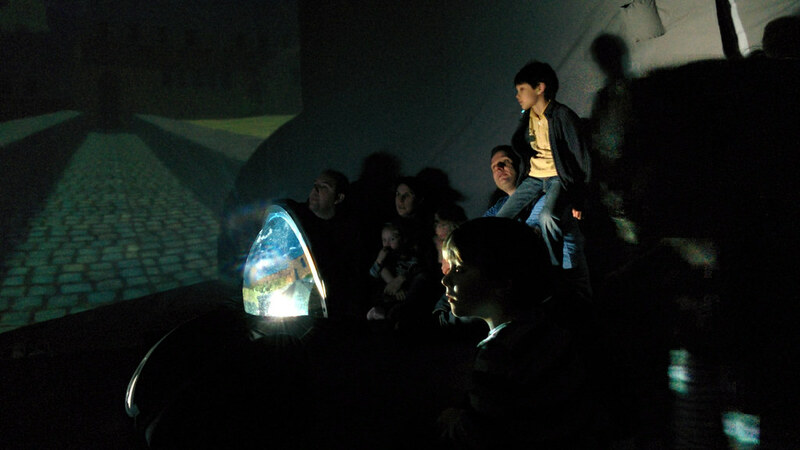 The Discovery Dome will be onsite at Chedworth Roman Villa from 8 to 18 April as just one aspect of Chedworth’s action-packed Easter holiday programme. Demand is likely to be high, particularly during peak hours (12pm-2pm) so visitors are advised to plan their visit accordingly.